Jared Diamond describes the global origins of writing, and the uses to which writing was put in its first few thousand years. [T]here have been only a few occasions in history when people invented writing entirely on their own. The two indisputably independent inventions, of writing were achieved by the Sumerians of Mesopotamia somewhat before 3000 B.C. and by Mexican Indians before 600 B.C. ; Egyptian writing of 3000 B.C. and Chinese writing (by 1300 B.C.) may also have arisen independently. Probably all other peoples who have developed writing since then have borrowed, adapted, or at least been inspired by existing systems. Besides Sumerian cuneiform, the other certain instance of independent origins of writing in human history comes from Native American societies of Mesoamerica, probably southern Mexico. Mesoamerican writing is believed to have arisen independently of Old World writing, because there is no convincing evidence for pre-Norse contact of New World societies with Old World societies possessing writing. In addition, the forms of Mesoamerican writing signs were entirely different from those of any Old World script. About a dozen Mesoamerican scripts are known, all or most of them apparently related to each other (for example, in their numerical and calendrical systems), and most of them still only partially deciphered. At the moment, the earliest preserved Mesoamerican script is from the Zapotec area of southern Mexico around 600 B.C., but by far the best understood one is of the Lowland Maya region, where the oldest known written date corresponds to A.D. 292. … While Sumerian and Mesoamerican languages bear no special relation to each other among the world’s languages, both raised similar basic issues in reducing them to writing. The solutions that Sumerians invented before 3000 B.C. were reinvented, halfway around the world, by early Mesoamerican Indians before 600 B.C. With the possible exceptions of the Egyptian, Chinese, and Easter Island writing to be considered later, all other writing systems devised anywhere in the world, at any time, appear to have been descendants of systems modified from or at least inspired by Sumerian or early Mesoamerican writing. One reason why there were so few independent origins of writing is the great difficulty of inventing it, as we have already discussed. The other reason is that other opportunities for the independent invention of writing were preempted by Sumerian or early Mesoamerican writing and their derivatives. We know that the development of Sumerian writing took at least hundreds, possibly thousands, of years. As we shall see, the prerequisites for those developments consisted of several features of human society that determined whether a society would find writing useful, and whether the society could support the necessary specialist scribes. Many other human societies besides those of the Sumerians and early Mexicans—such as those of ancient India, Crete, and Ethiopia—evolved these prerequisites. However, the Sumerians and early Mexicans happened to have been the first to evolve them in the Old World and the New World, respectively. Once the Sumerians and early Mexicans had invented writing, the details or principles of their writing spread rapidly to other societies, before they could go through the necessary centuries or millennia of independent experimentation with writing themselves. Thus, that potential for other, independent experiments was preempted or aborted. As for Chinese writing, first attested around 1300 B.C. but with possible earlier precursors, it too has unique local signs and some unique principles, and most scholars assume that it evolved independently. Writing had developed before 3000 B.C. in Sumer, 4,000 miles west of early Chinese urban centers, and appeared by 2200 B.C. in the Indus Valley, 2,600 miles west, but no early writing systems are known from the whole area between the Indus Valley and China. Thus, there is no evidence that the earliest Chinese scribes could have had knowledge of any other writing system to inspire them. [F]ew people ever learned to write these early scripts. Knowledge of writing was confined to professional scribes in the employ of the king or temple. For instance, there is no hint that Linear B was used or understood by any Mycenaean Greek beyond small cadres of palace bureaucrats. Since individual Linear B scribes can be distinguished by their handwriting on preserved documents, we can say that all preserved Linear B documents from the palaces of Knossos and Pylos are the work of a mere 75 and 40 scribes, respectively. The uses of these telegraphic, clumsy, ambiguous early scripts were as restricted as the number of their users. Anyone hoping to discover how Sumerians of 3000 B.C. thought and felt is in for a disappointment. Instead, the first Sumerian texts are emotionless accounts of palace and temple bureaucrats. About 90 percent of the tablets in the earliest known Sumerian archives, from the city of Uruk, are clerical records of goods paid in, workers given rations, and agricultural products distributed. Only later, as Sumerians progressed beyond logograms to phonetic writing, did they begin to write prose narratives, such as propaganda and myths. Mycenaean Greeks never even reached that propaganda-and-myths stage. One-third of all Linear B tablets from the palace of Knossos are accountants’ records of sheep and wool, while an inordinate proportion of writing at the palace of Pylos consists of records of flax. 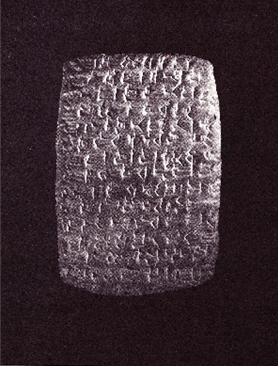 Linear B was inherently so ambiguous that it remained restricted to palace accounts, whose context and limited word choices made the interpretation clear. Not a trace of its use for literature has survived. The Iliad and Odyssey were composed and transmitted by nonliterate bards for nonliterate listeners, and not committed to writing until the development of the Greek alphabet hundreds of years later. To us today, it is tempting to ask why societies with early writing systems accepted the ambiguities that restricted writing to a few functions and a few scribes. But even to pose that question is to illustrate the gap between ancient perspectives and our own expectations of mass literacy. The intended restricted uses of early writing provided a positive disincentive for devising less ambiguous writing systems. The kings and priests of ancient Sumer wanted writing to be used by professional scribes to record numbers of sheep owed in taxes, not by the masses to write poetry and hatch plots.